Well, I’m in day 11 as a cancer survivor! 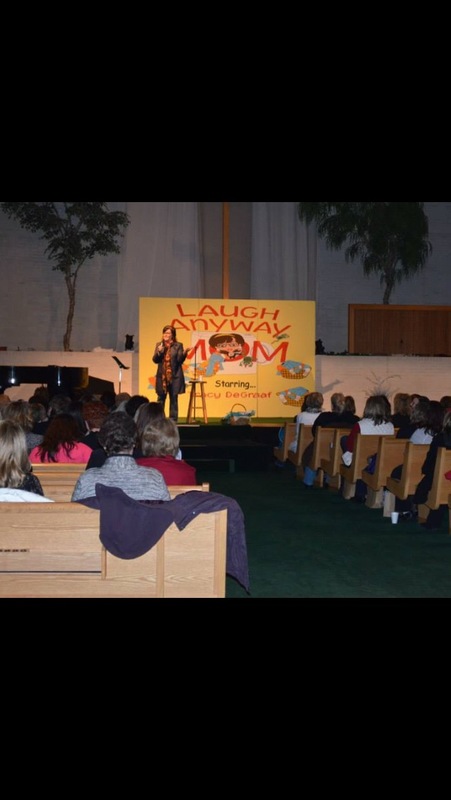 Last night I had a comedy show at a small church in Frankfort, IL. I didn’t feel like going at all, but as they say…the show must go on. I prayed and many of my family and friends prayed for me to be able to put my emotions aside and get out there and laugh anyway. I’d spent the whole day on the phone with various entities; my insurance company, the hospital pre-op test scheduling department, surgeon’s office and my frustration of navigating the whole mess weighed heavy on me. (I greatly dislike that insurance coverage is so complex and medical tests so expensive!) I also had the wonderful overwhelming emotions of love and support washing over me like ocean waves from my husband and our 5 sons, my dad, my in-laws, my sister and brother, and many other friends and family. My aunt called me to chat about some of the options I have in front of me, and I loved that she just picked up the phone and called. I felt loved at every level. All of that emotion processing was exhausting. Tears of frustration and tears of joy are still tears and by late afternoon, I was red-faced and puffy-eyed…a nice look for a comedian. I looked drunk! I took a shower and a nap and then got myself together to go to my show. It was amazing. The small church was packed. I started my show in the usual way, but felt like I wasn’t in my “groove.” Then I did my vasectomy joke, and that joke always gets two laughs. It has two punch lines. What I love about that bit is it feels like I’m pulling the audience into a feathery pit of laughter because I know that the first punchline always gets them, but the second one really gets them because it’s such a surprise. As I reeled them into the second laugh, I found my rhythm and the rest of the show was smooth sailing. Praise the Lord for laughter! For 90 minutes, I didn’t think about anything but laughter. Yes, cancer isn’t funny……laugh anyway! Click here to watch my vasectomy bit. It’s funny! Watch how after the second punch line the audience laughs and claps…..true joy for any comedian! Love you all! If you’re a women over 40 reading this please be sure your mammo is current! Please share this with your friends and family so they will be reminded to get their mammo too. If I hadn’t gotten my annual mammo, I wouldn’t know that cancer is in my body. Because of that mammo, we are catching this disease very early and my treatment options look good. It’s important!